Rocky Mountain Raceway, located in West Valley City, opened its 19th season on May 2. Despite the rain and poor weather, the racing on the oval track has been hot and heavily contested. 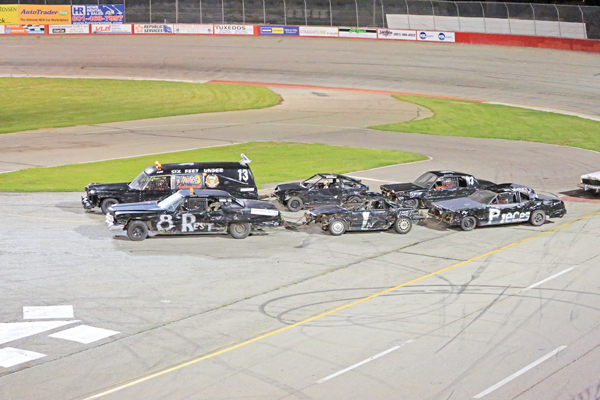 The 3/8-mile asphalt oval has provided Utah racing fans with some high intensity racing this spring. In North American auto racing, a short track is a racetrack of less than one mile. Short track racing is where stock car racing first became an organized and regulated competition. The 11 degree banking at Rocky Mountain Raceway has provided a great place for 10 classes of cars to compete for season championships. The premier racing class at Rocky Mountain Raceway is the Maverick Modifieds. These cars sit on large, slick tires exposed on all four corners of the car. They each run a stock crate Chevrolet 350 engine and will reach speeds at the end of the straightaway close to 100 mph. Michael Hale holds the track qualifying record, with an average speed of 86.26 mph. The 2014 modified champion, Mark Ith Jr., won the initial modified main event May 2. He is currently the class point’s leader. Jimmy Waters is in second place and Lynn Hardy is in third. On May 30 the modifieds ran a double points 100 lap main event. Dan McCoy and Ith Jr. battled nose to tail before a late race caution sent Ith Jr. to the back of the pack. McCoy finished first, 2013 track champion Tyler Whetstone second and Hardy third. “There was some bumping and banging between me and Mark. My car was fast tonight. I think he was the only one that could have caught me,” McCoy said in his finish line interview that night. The track hosts several other fan favorite racing classes. The figure eight trains consist of three cars chained together. The lead car has the engine, middle car is stripped completely and the third car has no engine but only a four-wheel braking system. The lead driver must navigate the figure eight track while his brakeman helps keep them from crashing in the center intersection. “I don’t know much about the cars, but I like to watch the trains and figure eight cars. They are awkward and it is fun to see them almost crash,” racing fan Jaylynn Merrill said. The double deckers are another favorite at the racetrack. In that class one car is attached on top of another. The top car steers while the bottom driver has the gas and brakes. Other racing classes include the super stocks, hornets, midgets, sprint cars, figure eights and mini cups. On July 4, Rocky Mountain Raceway is scheduled to host the annual Copper Cup Classic. Winged sprint cars from around the western United States are scheduled to compete. More information on upcoming events can be found on the track’s website www.rmrracing.com.